The Katherine Icon, a magnificent bronze statue, greets you as you drive into Katherine from the south. The project of the Northern Territory Cattlemen’s Association, it was erected in 2002, the Year of the Outback and pays homage to those who work the land, past and present, and to those who will face the challenges of tomorrow. We arrived in Katherine on a hot and sunny day in April and checked into the Shady Lane Tourist Park ([star][star][star][star]). And shady it certainly is, with its magnificent palms spread throughout the park. It didn’t take long to get our camp organised and have a bite to eat while we decided what to do first. A visit to the information centre after lunch was first thing and we learned there that the Ghan, Australia’s most famous train, is in Katherine today. John wanted to see the train – considering we had seen so much of the old Ghan in South Australia, he wanted to see one that actually works – however we couldn’t get close enough to it. We drove around to the station and managed a few photos but it was a little disappointing. High wire fences separate the road and parking area from the train. A swim with the crocodiles? Leaving the station we decided on a visit to the Low Level Nature Reserve on the banks of the Katherine River. 5 kilometres (3 miles) from town, it is a popular swimming, picnic, and fishing area for locals and visitors alike. There were signs all over the place warning of saltwater crocodiles but people didn’t seem to care and went swimming anyway! Not for me, thank you very much! 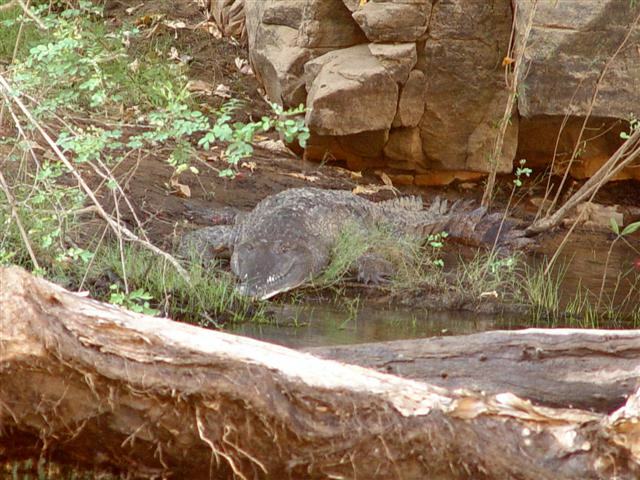 I don’t fancy being any crocodile’s dinner! Colonies of Flying Foxes can be found in the trees lining the river and their constant chattering created an awful racket. On the way back we made a quick stop at Knott’s Crossing so that John could see what the fishing was like. The site of the original settlement of Katherine, today it is a popular place for fishing and relaxing. There is a weir with a shallow crossing here that is reputedly very good for fishing and a man was standing on the weir but whether he was catching anything or not, we couldn’t tell. It was late in the afternoon when made our way back to camp and our “first night” bottle of Two Tails Sparkling Wine. This tourist park is a lovely spot and really is, as the name suggests, a shady lane. Beautiful grassy sites set among palms and many other trees. The only real sticking point is the cane toads. These ugly things are all over the place here, especially the bathrooms and laundry at night and I shudder just thinking about them. We were out of bed long before the sun came up the next morning and off to Nitmiluk National Park – formerly Katherine Gorge. 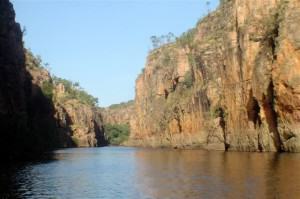 The Gorge itself is 29 kilometres (18 miles) from Katherine and we had arranged to take the Dawn Break Breakfast Cruise. There are not many things that can get me out of bed before sunrise on a Sunday morning but the chance to see the sun come up over Katherine Gorge is definitely one of them. Seeing the sun come up over those magnificent rock walls, the water so calm and clear, and the soft sounds of birds chirping as the gorge awakened made this the most perfect morning imaginable. The mist was rising above the smooth surface and the sun’s rays created rainbows. The cruise takes in 2 of the 13 natural gorges that have been carved through sandstone by the Katherine River over eons. The gorges are on different levels and so at the end of the first one we walked about 600 metres (about 1970 feet) to the next boat for our cruise through the second gorge. We took our time on the walk with cameras working overtime, not just us but everyone there. A big Aussie breakfast had been served while we’d cruised the first gorge and, more than pleasantly satiated, the walk did us good. We saw a number of interesting landmarks including Jedda Rock, the site of the final scene in that classic Australian movie “Jedda” (circa 1950), and the Rockadile, a rock that resembles the head of a crocodile. Our guide, with his tongue firmly planted in his cheek, claimed that this was the inspiration for Elton John’s famous “Crocodile Rock”! Sleeping crocodile? I don’t think so! huge South American Raintrees that surround the homestead were planted by the original owner’s wife; she wanted one for each of their children. The homestead is open to visitors and I found the history really interesting. Later that afternoon John went for a walk to the Katherine Outback Heritage Museum. 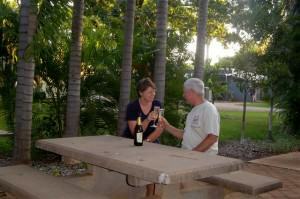 Located at the old Katherine aerodrome, it was originally constructed as an air terminal during World War II. 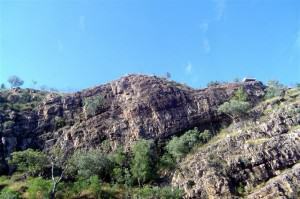 Today it houses artefacts and information that provides an insight into the history of the Katherine region. During the 1930’s Dr Clyde Fenton became the first Flying Doctor, providing medical assistance to remote stations and the major exhibit at the museum is his original De Havilland Gypsy Moth. This and most of the other displays are housed in the original terminal building. John said it was fascinating but I thought he was crazy to walk all that way in this heat! It’s school, but with a difference! -links or internet. So we made use of the pool this evening and it was fantastic! The water was cool but not excessively so like some of the others we’d been in. The days have been very hot and the nights warm which I suppose is not unusual for this part of the country at this time of year but it’s not something I’m used to and have had quite enough of it. Give me a cold, miserable, and blustery winter’s day any time! 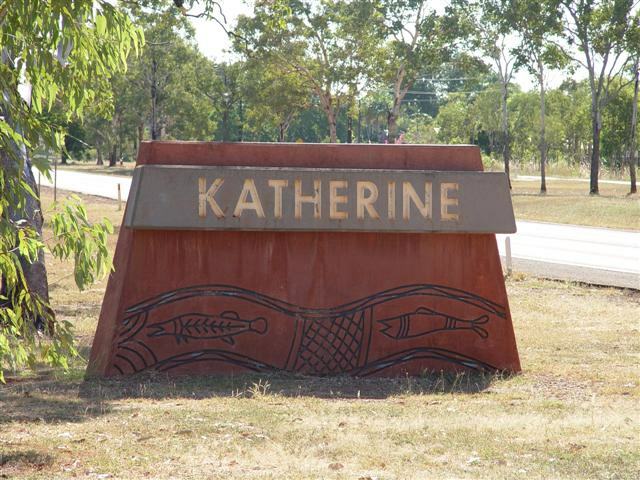 Katherine is the hub of the Katherine Region and is the third largest town in the Northern Territory. In the 1930’s the town had a population of around 250 but it became a major supply centre during World War II and today welcomes over 300,000 visitors a year. Positioned between three of Australia’s outstandingly beautiful areas, the Gulf Region, Kakadu, and the Kimberley in Western Australia, the town of Katherine is a perfect base for exploring the Top End. 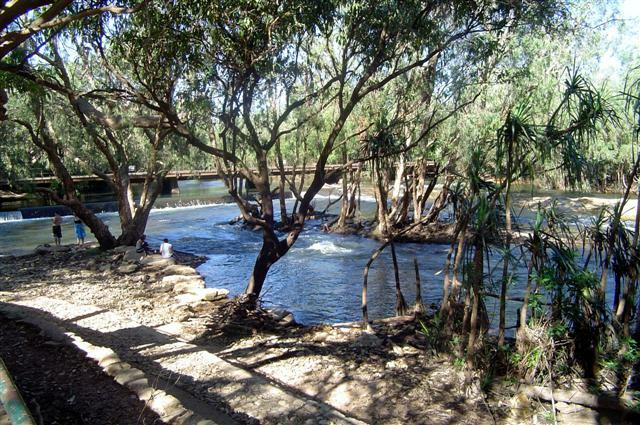 The Katherine River flows through the township and for millions of years it has been the centre of life and recreation for the local Aboriginals, the Jawoyn people. A pleasant and friendly town, it’s one I could go back to again and again.